In order to save one of the last Alaskin native tribes, Fang bands together with a friend of his master to stop miners from destroying a sacred land. The adventures of a heroic wolf and his friends in the Yukon during the Klondike Gold Rush. The words 'Lucio Fulci' and 'children's film' aren't what you would regularly see very often, and when you add 'animals' to that, alarms bells start ringing. Now, Fulci doesn't really register on the old Italian Film Directors Who Kill Animals For Their Films List, unlike Umberto Lenzi, Ruggero Deodato, Sergio Martino and Antonio Margherriti, but these White Fang films, of which he made two, sail close to the wind. However, I'm also of the opinion that, judging by the above examples, if an Italian director did go out of their way to film an animal being hurt, they would include that in the film, and that does not happen here. That's a long way of saying that you could probably watch these films guilt free, although this supposedly family-orientated film does start with a bunch of dogs eating a deer carcass. 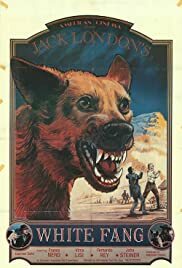 Thus begins Fulci's take on the classic Jack London novel about a dog who is a wolf/dog or something who never stops barking. It takes place in the Klondike in Canada during the gold rush, where a bunch of prospectors live in the mining town of Dawson, run by villain Beauty Smith (John Steiner, the best thing in the film). These unheeding miners are being ripped off by Beauty, who also runs the local bar, and keeps the alcoholic priest (Fernando Rey) in place so that no fully functioning minister can expose his nefarious actions. Beauty therefore is miffed when a government man turns up to set up a mining commission, who also brings along writer Scot (Franco Nero), a man with principles who immediately finds himself up against Beauty, as well as giving a few of Beauty's men a sock on the jaw. A nun also arrives in town to set up a hospital, and add to that the Inuit fella who not only brings his sick son into town, but also seems to have a very protective dog, White Fang, who takes an instant dislike to Beauty's dog Satan. There's a lot of characters to follow and a lot of plot threads, but most of it revolves around either Beauty or White Fang, so that's not too bad. Basically, a group of folk start to gather against Beauty and usually White Fang steps in to sort things out. This being a children's film, naturally this involves characters being stabbed in the gut, or White Fang either fighting a dog, or being forced to fight a bear! This film is PG, apparently! I think he killed someone as well, come to think of it. The set design is rather outstanding for this one, so there must have been a bit of money behind the scenes for a change, as Fulci uses every chance he has to sweep the camera across the town of Dawson and the various crowds. It gives the film an epic feel and really helps bring the cold atmosphere of Canada to life. The main attraction here is John Steiner as Beauty Smith. He's so evil he even has a pencil-moustache, although he doesn't twirl it. He's snidey, snobby, sneery, hates everything, makes passes at women, double-crosses everybody he encounters and only shows the barest of humanity when he accidentally kills someone. It's a hard call to outdo Franco Nero onscreen but Steiner does it effortlessly. Although Nero kind of gets sidelined with all the sub plots to be honest. My son watched about two minutes of it (and of course he walked in on White Fang fighting Satan) and was disturbed by it. The two animal fights are bad enough (although it's obvious in the bear fight that someone in a bear suit was involved to a certain extent), but the knifing of someone in the guts would be too much to handle for most kids. If Fulci complained so much about being pigeonholed as a horror director, why do so many of his non-horror films end up in that category anyway? So, to sum up, I have no idea whether I liked this or not. Therefore I give it a seven, just like every other film I review.